"I have no interest in competing," says Lew. 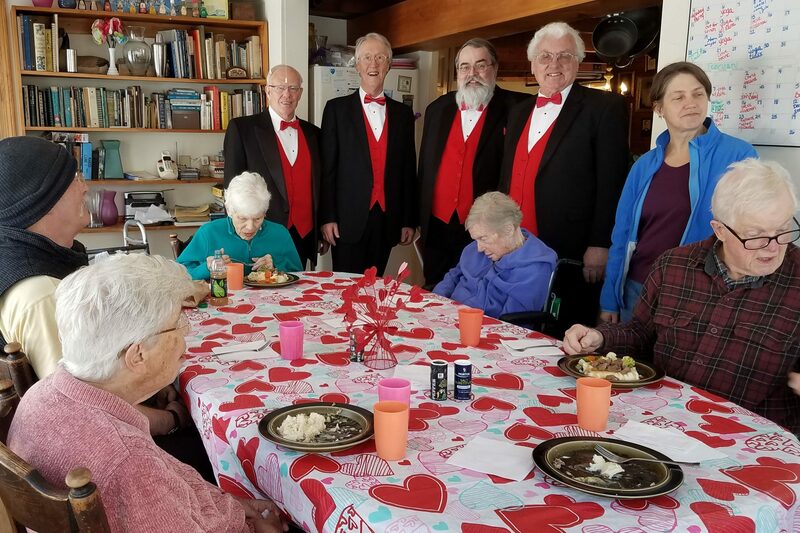 "I sing to bless people"
Between Thanksgiving and Christmas, between my chorus (Nor'easters of Brunswick, Maine) and my quartet (Porch Time), we sang 23 gigs in nursing homes and assisted living facilities. In one nursing home, we were asked if we would go upstairs and sing in the dementia unit. We did, not sure if anyone would notice. But as we sang, a number of the folk seemed to awaken to the music. A friend of mine who is a geriatric RN later told me that the section of the brain that stores and relates to music is not affected by dementia. When that portion of the brain is stimulated, it stimulates the whole brain. On another occasion, at a resources show for elderly, a middle aged lady with her aged mother in tow came up to us and asked if our quartet could sing something from the '50s. I joked, "I'm sorry, madam, we don't sing anything that modern." We sang "I'll Be Seeing You", and as we did, she sang the whole song along with us. This is why I sing barbershop (and also Gospel). I have no interest in competing. I sing to bless people, and it does!